Purchase our “Try Me on for Size” multisizer to accurately measure your toe or thumb size at home. This plastic sizing tool can be used over and over again. 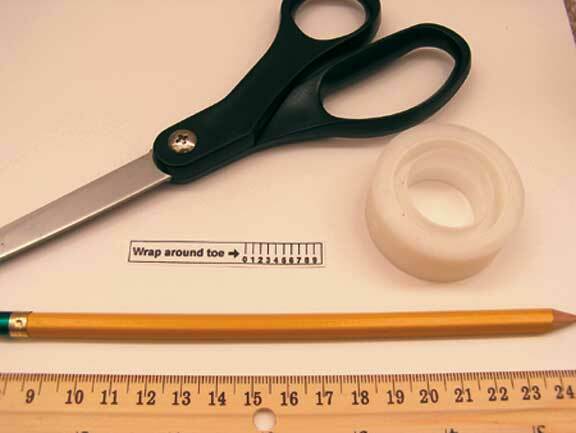 You will need a pair of scissors, a pen/pencil, a metric ruler, tape, and a printer. NOTE: clicking all small images will open a new window with the larger image. 1. Print out the sizer on this PDF (1o8K). NOTE: go to “Page Setup” and make sure that the box “fit to page” is unchecked. This is where you need the metric ruler: the length of the sizer from one edge to the other must be 62mm—if it’s not, you’ll need to use Technique 2. Call for help at 650-941-8044. 2. Carefully cut out a sizer revealing all of the outer lines (with the outline remaining). It doesn’t have to be perfect. 3. Attach a small piece of tape on the far left side of the paper ruler (see Fig. 1). 4. You will be sizing two parts of your second toe. 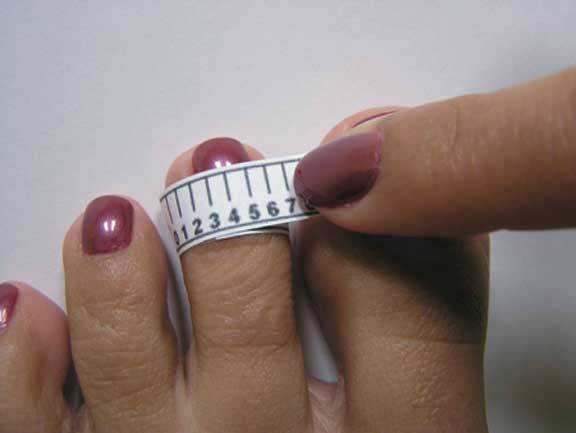 First, measure the toe pad; this is the thickest part of the toe, usually at the base of the cuticle. We suggest you tape the sizer to the top of your toe, then wrap it from left to right around the toe. Mark where the number meets the far left edge of the sizer (see Fig. 2). 5. Next, measure the middle section of your toe, just below the toe pad, in between the two knuckles—not at the base as we do for fingers (see Fig. 3). 6. 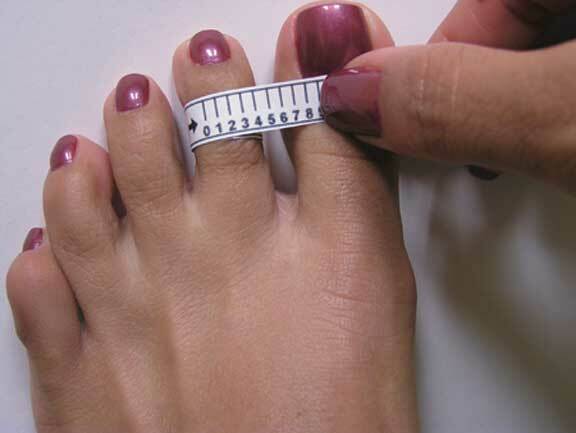 To ensure an accurate fit, please wrap the sizer snugly around your toe (your Toe Ring will not be snug). Mark where the number meets the far left edge of the sizer (see Fig. 4). 7. Sizing your toe can be tricky, therefore we recommend repeating this process several times until you are able to obtain the same measurement at least twice for both parts of your toe. 9. Check our conversion Chart to see what size you should order. 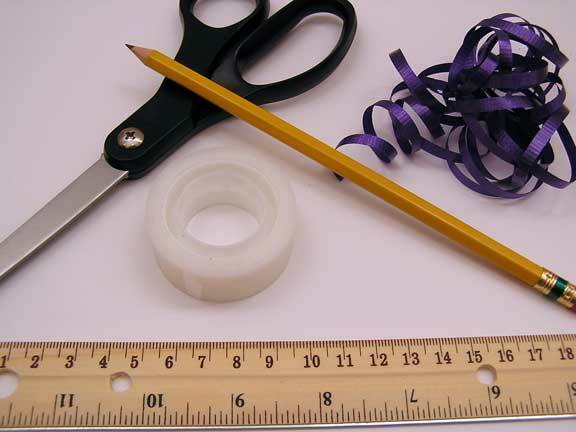 You will need scissors, ribbon (3"-4"), a pen or pencil with a sharp tip that can write on ribbon, a metric ruler, & tape. 1. Cut approximately a 3-4 inch piece of ribbon. 2. Attach a small piece of tape on the far left side of the ribbon. 3. You will be sizing two parts of your second toe. First, wrap the ribbon around the toe pad; this is the thickest part of the toe, usually at the base of the cuticle (see Fig. 1). We suggest you tape the ribbon to the top of your toe, then wrap it from left to right around the toe. Mark where the ribbon meets the edge (see Fig. 2). 4. Next, measure the middle section of your toe, just below the toe pad, in between the 2 knuckles (not at the base as we do for fingers). Wrap it from left to right around the toe (see Fig. 3). Mark where the ribbon meets the edge (see Fig. 4). 5. 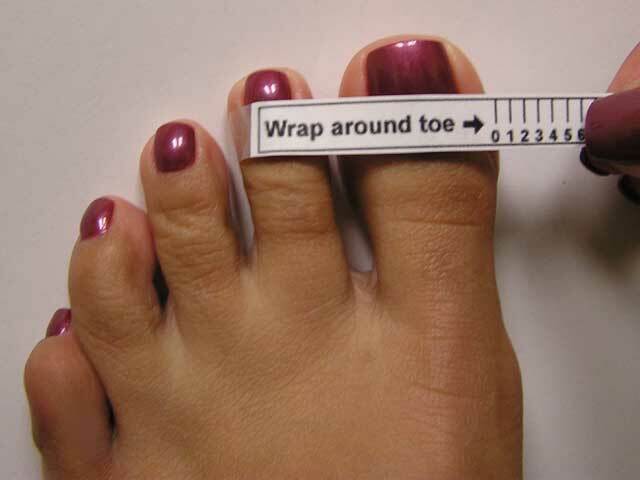 To ensure an accurate fit, please wrap the ribbon snugly around your toe (your Toe Ring will not be snug). 6. Sizing your toe can be tricky, therefore we recommend repeating this process several times until you are able to obtain the same measurement at least twice. Remove the ribbon from your toe. 7. Measure in millimeters* from the edge of the ribbon to the marks you made. 8. Enter the number for both the tip & the middle of your toe when placing your order (see Fig. 5). 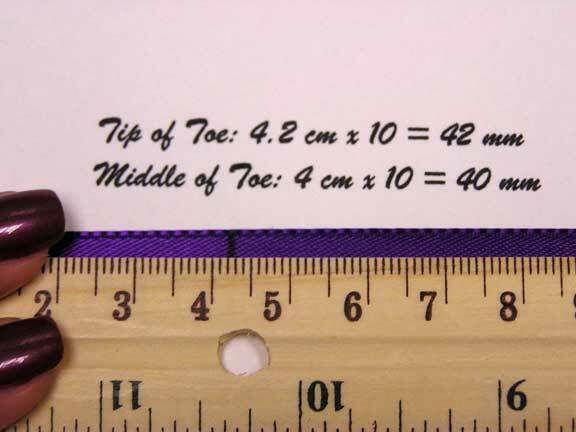 * Millimeters are located on a standard ruler, opposite of the inches. Millimeters = Centimeters x 10. (For example: 4.7 centimeters would be 47 millimeters.) Please call if we can assist you in any way at 209-551-0701. 1. By far the most comfortable toe for a Toe Ring is the second toe (the one next to the big toe). Approximately 5% can wear a Toe Ring on any other toe. You are welcome to size another toe, and if it's not comfortable, we are more than happy to exchange it. See Guarantees & Exchanges. 2. For some, the foot with the straighter, less bulbous toe tends to be more comfortable (usually the left foot). 3. Again, these sizing techniques will only be successful if the tool is wrapped snugly around the toe. 4. Our Toe Rings are available in over 50 sizes which ensure complete comfort for approximately 95% of our clients. See Guarantees & Exchanges for more information. 5. For further information, see “Common Questions” or give us a call at 209-551-0701.